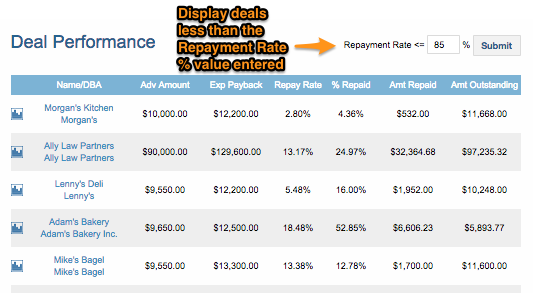 The Deal Performance Dashboard displays a listing of merchant cash advance deals based on the deal's Repayment Rate. The Repayment Rate is the percentage of the Total Amount Collected [divided by] the Total Amount the Funder expected to collect as of today. For example, you expect to get $100 day and 5 days have passed and you only have $100. This means the merchant is at 20% (because you should have collected $500 already). Ideally, the Repayment Rate for all the merchant cash advance deals should be near 100%. Users can enter a value in the Repayment Rate textbox and click on submit to find all Funded deals with a Repayment Rate of lower or equal to the value entered.